Is it a Talktalk Huawei YouView box? Argh! No freaking are they doing this! Well another little twist that can be found in the TT Community Forum. At present if your YouView box is faulty TalkTalk will replace it for free. Going forward they will only replace a faulty unit if you are paying the "access fee". If you opt out of paying the "access fee" as a lot of people are doing and your box develops a fault then tough. That's not a twist though... They were doing it as a gesture of goodwill. They have a 12 month warranty on the box that they must replace regardless of the £4 being paid or not. 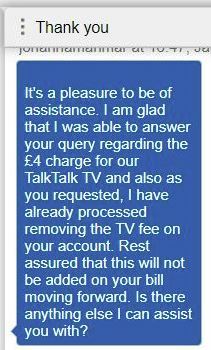 If they box fails after 12 months they have no obligation..Their T&C's already say any box replaced after 12 months remains the property of Talktalk. Mine is, yes. One of the original, ultra-slow boxes. Bought from a private eBay seller 4+ years ago. Well after 42mins online I've finally managed to make sure I'm opted out of TV services and have made sure I have copy of transcript, this is a story worthy of being on front page to Thinkbroadband. p.s. I see it's made the front page. p.p.s Well one thing made me smile, the emailed copy of transcript which was sent from TalkTalk to my TalkTalk webmail went into the spam folder. But at what point does "custom and practise" take precedence over T's and C's. Anyway - I have arranged for no additional charge on my account for the duration of my current contract (another 6 months). They do seem to drop the charge without much objection. At the moment I am paying £6 per month for the entertainment boost. Theoretically I could be paying £16 for the same programs in a couple of months - don't think that is going to happen. Do you expect them to replace it for free forever? I think the £4 charge is deplorable, but the box has a 12 month warranty and I'm not aware of a single company that will replace your box after you have left the TV package after the boxes 12 month warranty. That part of it is perfectly legitimate. Charging new customers who have never had TV, simply because they own their own YouView box, is not okay. I await a comment from YouView, who Talktalk part own. I think the answer to that was YES. Note - past tense. I was under the impression that the TV service was just one part of my overall broadband package charge. I never asked for it - the Youview box was just sent when I joined TalkTalk (some years ago). So, IMO, they are trying to charge me for something they gave me for "free" - an unsolicited gift ? 10 minutes on TT live chat and i have opted out, no request to send the box back and my box will work as it did before i opted out, this is not going to do their already tarnished reputation any favours.